My sugar coated life...: Yet another reason to eat cake! Yet another reason to eat cake! Welcome all to 2010, another year without flying cars but with copious amounts of cake and cookies to make up for it! Hooray! 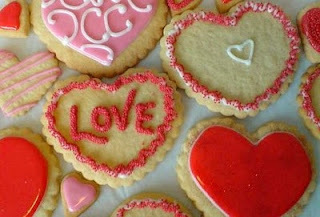 And what better reason to buy edible treats than for the one you love than Valentine's Day. Yes, its only 6 weeks to go till we celebrate the most romantic day of the year and we really have got our thinking caps on here at the bakery. We will be offering new sized gift boxes (holding 9 cupcakes instead of 6), heart shaped cookies and personalised mini cakes for the cake lover in your life. Keep an eye on our website as we'll be posting our seasonal goodies soon. Incidentally, today marks my first day of official self employment! An exciting time lies ahead for Star Bakery as I finally have time to do all of the things that will make this business bigger and better in 2010. Thank you all for your continued support over the past year, we have been consistently busier month on month and that's all thanks to all you cake fanatics out there. It's great to follows your business' growth. This year will be a great year for both of us, cakebakers and cupcakes of course. Thanks, 2010 is the year for us bakers - I can feel it!